There you are. My luck. My Fate. My pepperoni and double cheese. Eau de Pizza Hut. Unforgettable. If the smell of a Pizza Hut box being opened was a perfume, the restaurant chain asked this summer, what would it be called? The answers were many and varied - "Diabetes Sock Freshener," "NAFTA Results" and "Wilford Brimley's Tears," to name just a few - but they all ultimately led to an even more intriguing and urgent question: Why isn't the smell of a Pizza Hut box being opened a perfume? Based on the strong response to the original Facebook post, Pizza Hut Canada hired a perfume maker to whip up a scent. "We smelled a range of four or five, my team and I, and we zoomed into one we liked that smelled closest to what we were hoping for," Pizza Hut Marketing Director Beverly D'Cruz explained. "Some of them smelled like cheese and you know how delicious cheese tastes, but it doesn't smell as delicious. The smell of freshly baked bread is one we all loved." "All we're trying to do is have some fun with our consumers," she continued. "[Marketing] is becoming a two way conversation instead of a one way download. Previously it was TV [ads] and it was just one way. Now it goes both ways and you're listening to people and responding." 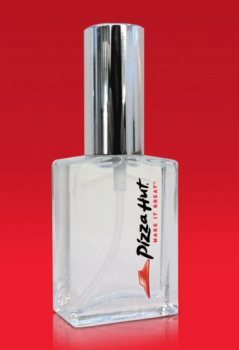 Sadly, only 110 bottles of Pizza Hut Perfume were created, and they've all been spoken for. The first 100 people who sent a direct message to the company on Facebook asking for the perfume got one, and the rest were presumably either distributed to company employees or secreted away in a deep, dark corner of Pizza Hut's head office. Could this stuff end up in stores someday? "Who knows what the future has in store?" D'Cruz said. Hey, it's no worse an idea than the hotdog-stuffed crust, am I right?